Monique Jenifer may have gone to school for business management and accounting, but it was fate that led her to her position at Spaulding Youth Center back in 2006. She had been working for a construction company when she came across a nanny position for two children with PTSD. After caring for the two children, Monique knew working with children in need of a healthy childhood full of love, care and stability was her true calling. She began her journey at Spaulding as a residential aide after recommendations from two friends who were already employed on campus. Soon after, Monique was approached to consider working in the school and bring her demonstrated skills to the academic environment. After substituting whenever possible in the school, she discovered her love for being in the classroom and now supports the children of Spaulding as a Teacher Associate. In this role, Monique helps students complete their academic work and is instrumental in behavioral management. 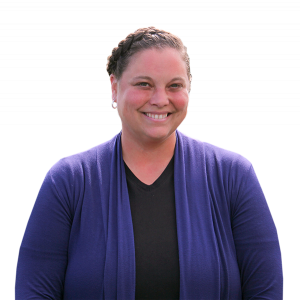 Monique truly has a knack for helping the classroom remain calm, focused and on schedule – three critical variables for academic success. Monique’s dedication to her job does not go unnoticed. She was the recipient the Spaulding Youth Center Associate Teacher of the Year Award in both 2015 and 2018 as well as the Academic 1:1 of the Year Award in 2011. Her favorite element about Spaulding is the wonderful community within the organization. Monique feels Spaulding is so much more than a place of work. The organization truly is a big family, filled with hard-working people collaborating to achieve so much for children who are in need. Monique believes that the 2012 opening of Spaulding’s new school building provided a central location to bring everyone around campus together and created a better sense of unity and staff-wide support. In her spare time, Monique enjoys spending as much time as possible with her family, including her husband, Doc, who is also a Spaulding employee and recent Spaulding Spirit Award recipient.